This name uses Spanish naming customs: the first or paternal family name is Lacalle and the second or maternal family name is de Herrera. Luis Alberto Lacalle in 2014. 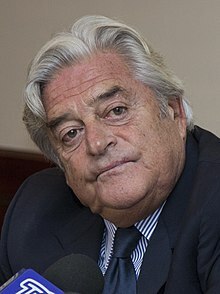 Luis Alberto Lacalle de Herrera, GCMG, (Spanish pronunciation: [ˈlwis alˈβeɾto laˈkaʎe ðe eˈreɾa], known as Cuqui (born July 13, 1941) is a Uruguayan lawyer and politician who served as President of Uruguay from 1990 to 1995. His mother, María Hortensia de Herrera de Lacalle, was the daughter of the Blanco political leader Luis Alberto de Herrera, after whom Lacalle was named. Luis Alberto Lacalle joined the National Party at the age of 17. In 1961 he started working as a journalist for Clarin and he graduated from the University of the Republic's law school in 1964. In 1971, he was elected deputy for Montevideo and kept his seat until the 1973 coup, when President Juan María Bordaberry dissolved parliament. In August 1978 Lacalle was sent three bottles of wine tainted with poison  addressed to himself and two fellow National Party members (Heber and Pereyra) who had been trying to negotiate a way out of the military regime. Lacalle's wife warned him against the suspicious gift, but Heber's mother drank a glass, dying immediately. The case remains unsolved. When democracy was restored in 1984 he was elected senator, and became vice-president of the Senate. In 1989 he ran for the presidency for his faction, Herrerismo, with running-mate, Gonzalo Aguirre. In the subsequent elections in November 1989, the National Party defeated the rival Colorado Party (running with several presidential candidates: Jorge Batlle Jorge Pacheco Areco and Hugo Fernandez Faingold and Broad Front (running with presidential candidate Líber Seregni. Lacalle received the most votes within his party, defeating Carlos Julio Pereyra and Alberto Zumarán, and thus was elected President of Uruguay, taking office on March 1, 1990 for a five year-term. Upon taking office, Lacalle sent parliament a tax reform bill which was immediately passed with the support of the Colorado Party. Sales tax were increased (from 21% to 22%  income tax was increased and a few other taxes were created. During his rule, he encouraged a free market program, participated in the Brady bonds plan to alleviate foreign debt obligations, and was a co-founder of the Mercosur, along with the presidents of Paraguay, Brazil, and Argentina, which came into effect with the Treaty of Asunción in 1991. In the 1994 national elections, he selected his Interior Minister, Juan Andrés Ramírez to be the presidential candidate of the Herrerismo faction. The National Party narrowly lost the elections to the Colorado Party. Among several prominent politicians who took part in his government are Héctor Gros Espiell, Sergio Abreu, Juan Andrés Ramírez, Carlos Cat and Ignacio de Posadas. Luis Alberto Lacalle at the 2011 Miami Book Fair International. In 1999, he won his party's primary elections against Juan Andrés Ramirez (who had split from the Herrerismo) and several other candidates, and was a candidate for presidency again. However, a string of accusations about corruption in his government damaged his chances. Ramírez's departure from active politics after losing the primary was the final blow, and Lacalle came in third place with 22.3% of the votes in the general elections. Lacalle ran again for president in the 2004 elections, but the other party leaders had gathered around a single opposing candidate, Jorge Larrañaga, who defeated him in the primaries by a 2-to-1 margin. In 2009, he ran for the presidency again, this time defeating Jorge Larrañaga in the June primaries. By winning the primary election, he became head of the governing board of the party. He lost the presidential elections to José Mujica in a run-off election in November. Lacalle is a member of the Club de Madrid and he is member of the board of the Public Affairs Committee of the Jerusalem Summit. Lacalle is married to María Julia Pou Brito del Pino (b. 1946); they have three children, Pilar Lacalle Pou, Member of Parliament Luis Alberto Lacalle Pou and economist Juan José Lacalle Pou. Luis Alberto Lacalle Pou was the 2014 presidential candidate of the National Party. He entered the second round of the elections. ^ "Former guerrilla and former president headed to runoff in Uruguay". ^ "La reforma tributaria, el debate ideologico" (in Spanish). www.larepublica.com.uy. 2008-08-21. ^ Charles Blake (1998). "Economic reform and democratization in Argentina and Uruguay". Journal of Interamerican Studies and World Affairs. 40 (3): 1–26. doi:10.2307/166198. JSTOR 166198. ^ The Club de Madrid is an independent organization dedicated to strengthening democracy around the world by drawing on the unique experience and resources of its Members – 66 democratic former heads of state and government.